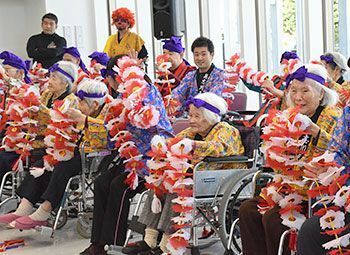 The group, which has an average age of 80, was launched with members at the Gushikawa Koseien social welfare facility for the elderly this April. Twenty members from 65 to 102 years old performed during the first performance held outside of the facility. The audience who gathered at the venue waved their handmade shiny fans and sung folk songs together, ending the show on a high note. The group is modled after an idol group in Kohama Island called Kohama Island Bachan Choir Group, also known as KBG 84. Gushikawa Koseien members raised their voices saying, “we can do better,” and formed a performance group with those who practice folk songs and a castanet-like Okinawan instrument called Yotsudake once a week. They named the group as GGB Performing Group and plan to host one performance per year. Kazuko Yamada, who is 102 years-old and the senior member of the group, performed in the center spot.